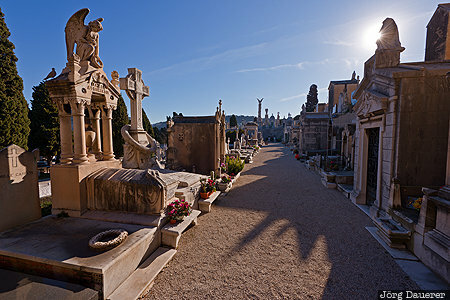 The Cimetière du Château (an old graveyard in Nice) stands on the old citadel of Nice (chateau de Nice or castle of Nice). The impressive tombstones are illuminated by warm morning light. Nice is in Provence-Alpes-Côte d'Azur in the south of France. This photo was taken in the morning of a sunny day in March of 2015. This photo was taken with a digital camera.